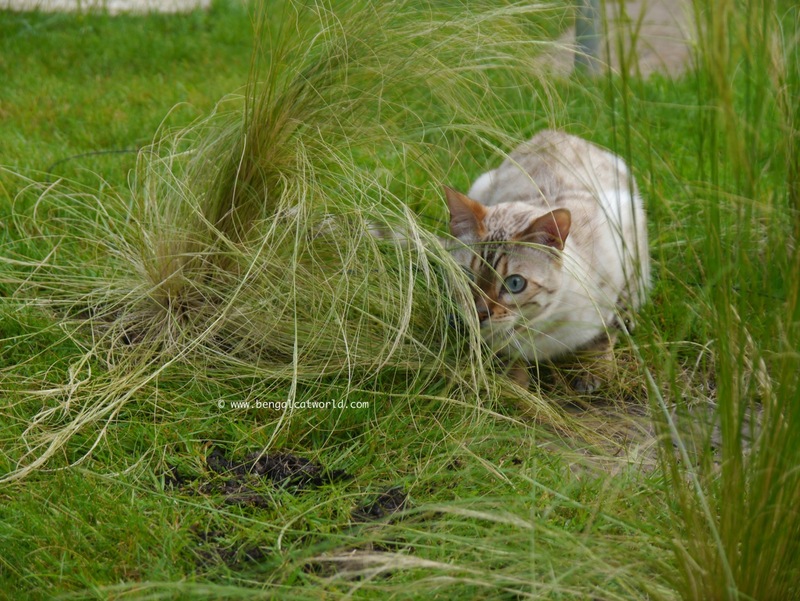 You’ll no doubt be aware that our Lula loves playing in long grasses, so much so that daddy has planted lots for us in our garden to play in! Here she is, showing how much she loves it! We can still see you, Lula! I always thought that Lula was a bit odd…. until I saw all the little bugs that hide in the grasses! There are lots of them! 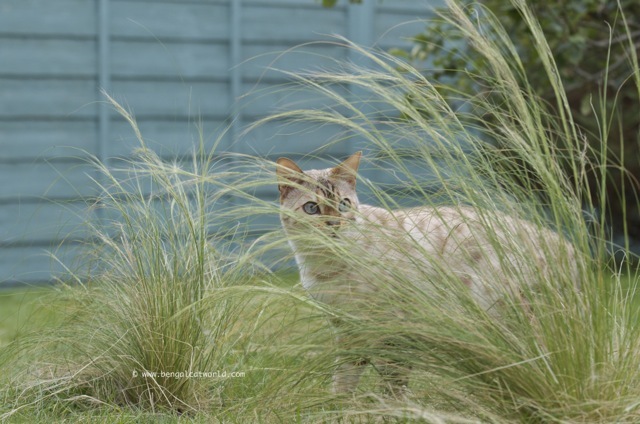 Plus, as the grasses are growing, they are becoming better and better for hide and chase games! Who would have thought that something so simple could be such fun?! I bet you can’t see me?! Speak again soon my friends! 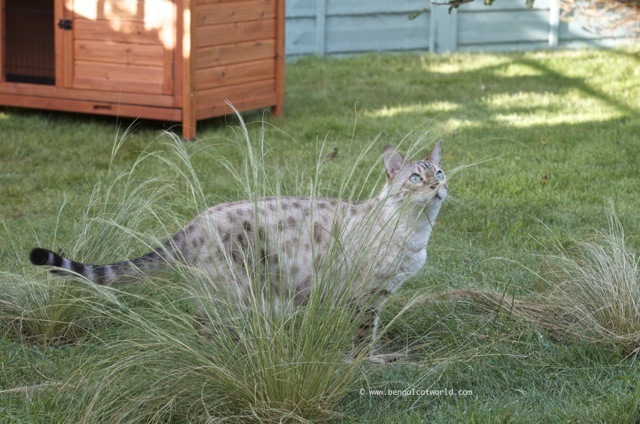 Oh Lula and Spot you are so lucky to have such a wonderful Mommy and daddy to give you this fantastic garden to play safely in each day! I don’t want you to get a “big head” but you and Lula are absolutely the most gorgeous bengals I’ve ever seen! When I saw your picture yesterday as a young kitten, my first thought was that is the one I want but then I realized that it was you Spot!!! We currently have a brother and sister pair of tuxedo cats but no bengals and I would love to have one join our family. 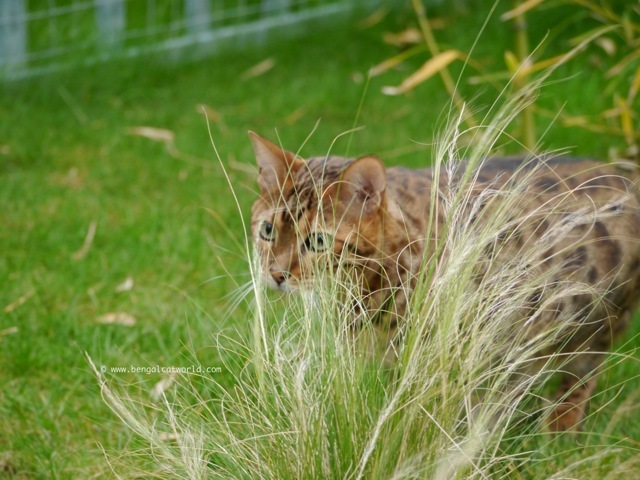 We have been following Spots and Stripes Bengal Cat Rescue in Florida trying to find a Bengal that’s possibly half as special as you and Lula. I’m sure your Mommy and Daddy know that they have the best bengals anyone could hope for. And of course there are your brothers and sister too! I’m so happy to have found you and look forward each day to your special greetings from the UK! Have a very special caturday tomorrow!